You might start off asking, “What’s the big deal, why do I need a logo?” Your logo defines you or your business and is the first point of contact with the outside world. It is how people will recognize you; therefore it will establish your credibility, trust, and professionalism. A logo needs to be memorable, unique, relevant and recognizable. Your logo should tell the story of your business and represent what it is your company is trying to say. You need to remember that sometimes the logo is the first thing your customers will see and sometimes it is the only thing they will see (if it is on marketing material). Therefore it really needs to explain what it is your company is about so people don’t get the wrong idea and misjudge your brand. Knowing what your company is all about, what is your story, your vision and goals. Understanding your target audience will be a key factor in designing a logo that will fit your demographics. Identifying how you are different will help you find ways to set you apart from your competition when designing your logo. Once you figure out what it is you want your company to say, the next step in our logo design 101 guide is coming up with a business name (if you don’t already have one). We all know how deciding on a business name can sometimes be a daunting task. However, once you figure it out, adding your business name to your logo graphic is crucial to building your brand awareness. If that is the way you decide to go. Or maybe your font is going be the key or principal element used to make up your business’s entire logo on its own. That is why choosing the right font for your logo is a very important task; as different fonts evoke different responses. You need to know who your key market is, as using the wrong font for the wrong market could be detrimental to your business. You don’t want to choose a font that your target market can’t read, understand or relate to. There are thousands upon thousands of different fonts to choose from. Some fonts are traditional and formal, others are elegant and refined, and some are playful and whimsical; make sure you choose the right one for your brand’s identity. 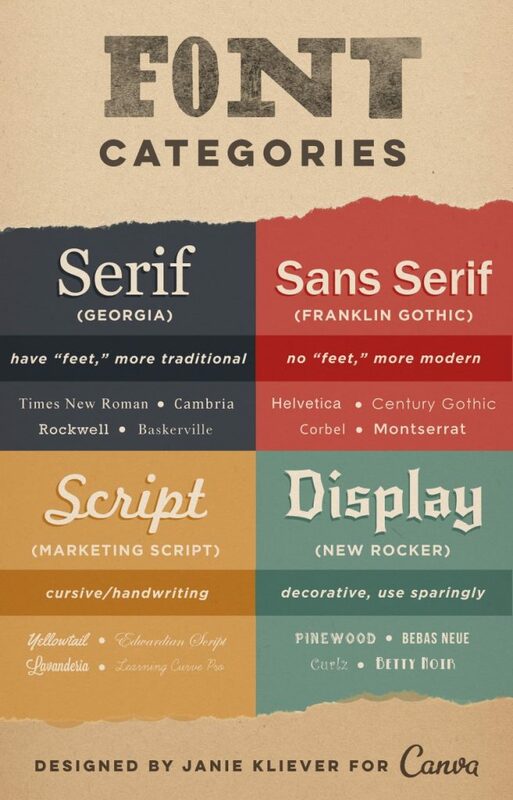 Here is an image of the different types of fonts. Sometimes the choice can get a little overwhelming so it is best to take your time and narrow it down accordingly. The reason you choose a specific colour is just as important as the name you choose. Each colour has a specific meaning and emotion behind it. And by choosing the right colour you can convey that emotion, however, if you choose the wrong color it could have a have a huge negative impact on your business. We have written a few blog posts about colour theories and the meaning of colours before. You can check those out on our blog, but here we will simplify them a bit. 33% use blue – – Blue represents professionalism, a sense of calm, and identifies trust. 29% use red – – Red helps to stimulate people to make quick decisions, it is associated with boldness, passion, and strength. 28% use black or grayscale colours – – Using blacks and grayscales offer a sense of elegance, professional and sophistication. It is always a great balance to use one colour and balance it with a shade of grey or black. 13% use yellow or gold colours – – Yellow is the colour of happiness, encourages optimism, and friendliness. 95% use one or two colours – – Think of some of the world’s most successful logos, such as Pepsi, Coke and Starbucks, which use just one or two colours each. You need to make sure you choose the right colour that harmonizes with your brand and fits your target audience. You also need to make sure that the colours you choose for your logo will look good no matter where it appears. That means on your business cards, your website and all of your packaging and marketing products. Be timeless, not trendy – – You never want your logo to be dated, you want to make sure it will stand the test of time. Will your logo still be effective in 10, 20 or even 50 years? 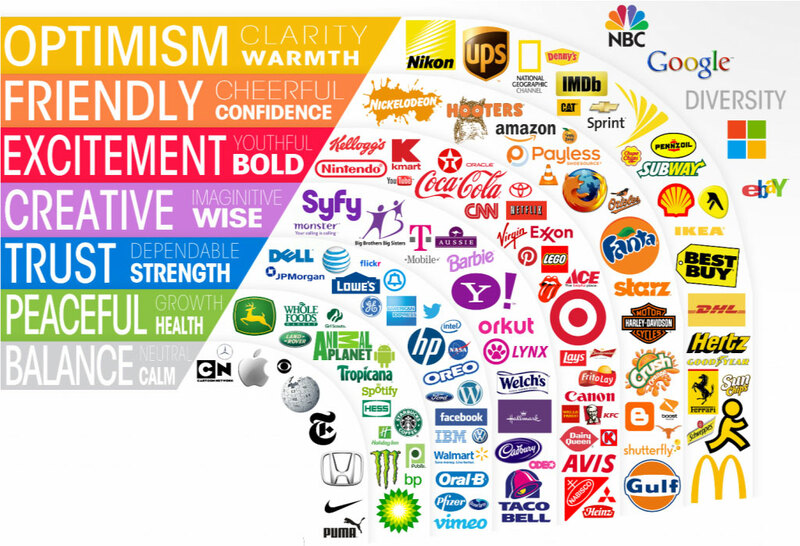 Keep it clean and simple – – A clean and uncluttered logo triggers positive human responses. Keeping the design simple helps the logo to be easily recognizable and gets your message across clearly and provides stability. Be unique and clever – – Stand out from your competition, be innovative, and design something out-of-the-box. An effective logo needs to be memorable – – Your logo needs to stick in your users’ mind after they leave your site or store. You want them to tell others about you and a great logo will do just that. Classic – – Tells your audience that you are reliable and down to earth. Vintage – – When you use a vintage logo it shows that history is important to you and that what you are selling is done right. Modern – – A cool, minimalist logo shows that your brand is up-to-date and knows what matters. Fun – – This design style is popular for a younger customer base and great to create a positive and friendly vibe. Handmade – – This is a great option for handmade products and works well in combination with other design styles for a simple and sophisticated look or a bright and youthful look. A Monogram or Lettermark is a logo comprised of the company’s initials. If a company has a long name, or if it’s hard to remember; it is a lot simpler and effective to use their initials for their logo. For example, how much easier is it to say—and remember—NASA versus the National Aeronautics and Space Administration? However, they are not great at expressing what your business is about and it will take a bit for people to learn who you are if you just use your initials. Although you could use both if you have concerns. A Wordmark is a font-based logo that focuses on a business’ name alone. This type of logo design works best when you have a distinct name that is catchy and memorable. When you have a strong name and combine this with a great typography; you will create a logo that works amazing for your brand. Your logo could end up being timeless, memorable and recognizable – – just look at the logos below. When you think of the word “logo” most people probably think of the image. Pictorial logos are the icons or graphic-based images that users recognize a brand from. You need to choose something that is unique but that represents your brand properly; as it will be with your company for its duration. Companies often pair a pictorial logo with text as a company just starting out, users will not know who the business is with just the image. An abstract logo is still using an image, but when you don’t want to use a recognizable image and when you want to evoke a feeling more than a thought. One of the greatest advantages to abstract logo design is the uniqueness to this type. No one else will have a logo like yours, your brand will stand out from everyone else’s. Logo mascots are often cartoonish, fun, colourful and a great way to give your brand an entertaining personality. They are a great way to draw in family-friendly clientele and service companies. Mascot logos are a good option if you need flexibility as they can grow with your company and can be used in diverse ways. 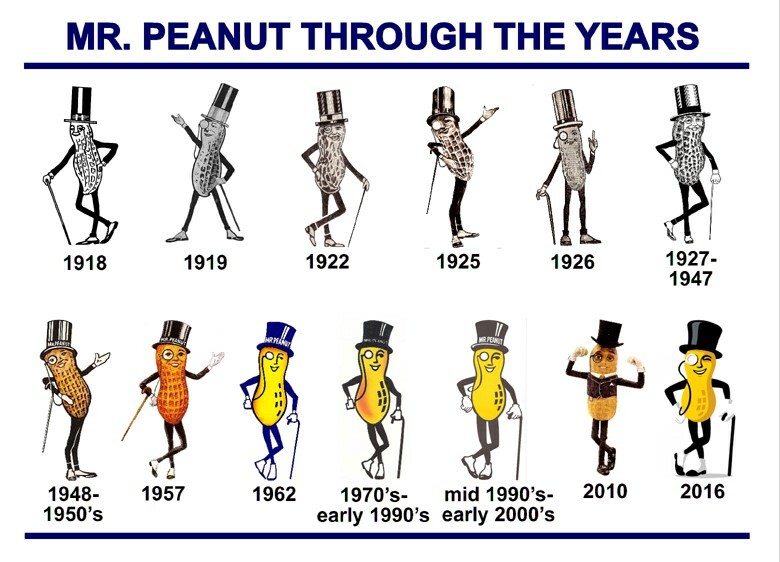 Take Mr. Peanut for example. A Combination logo mark design does exactly as it sounds, it combines an image or symbol with a wordmark or lettermark. The brand name is either integrated within the graphic element or laid out alongside the image or below it. This is one of the more common choices you see as it is so versatile, and users become familiar with your brand quicker. These logos are usually easier to trademark than a pictorial mark alone. An Emblem logo design is text inside a symbol or an icon; such as badges, seals or crests. This is a pretty classic style and is often the go-to choice for many government agencies, organizations and schools. These logos have a traditional look and feel but are also being used for beer and coffee businesses. You just need to be careful to keep the designs on the simpler side as when you shrink them or have them embroidered you could lose some details. Now that you know how to design a logo, what next? We have gone over a lot of different aspects in our logo design 101 guide and what makes a great logo. 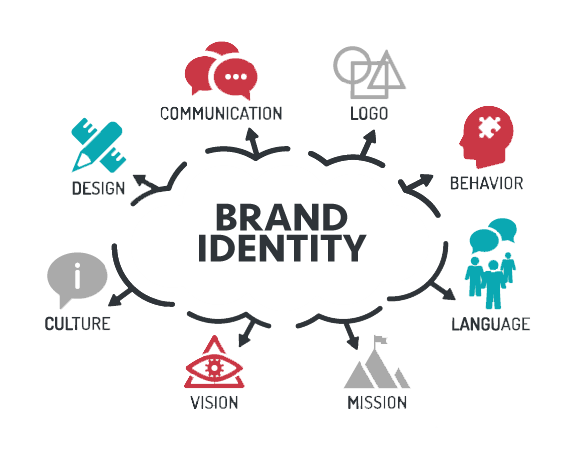 If you take your time and figure out what it is you really want your brand to say, figure out what design style you wish to go with and choose meaningful text and colours you will design a great logo to represent your company. Here at AllCore our design team can help you design a logo that will tell your brand’s story or we can answer any questions you might have. 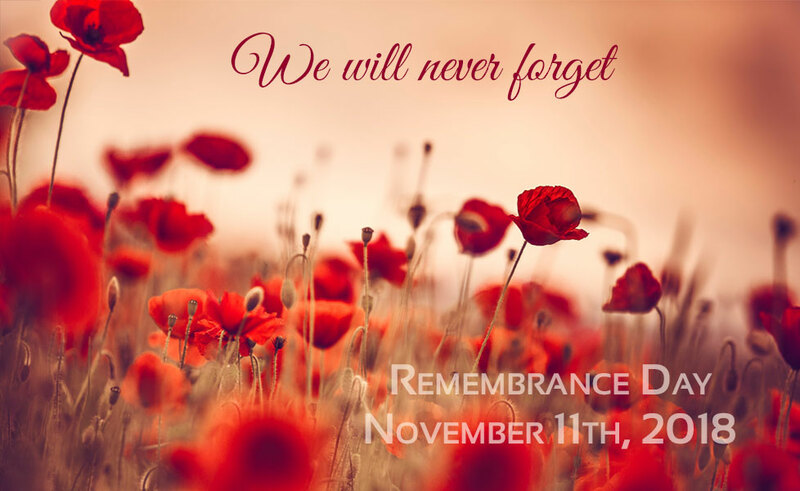 Contact us today at 1-866-320-0011 or email us at creativeservices@allcore.ca.